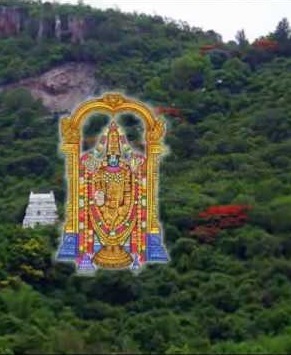 AzhwAr says in this pAsuram “When it is said that thirumalai (thiruppathi hills) itself, which is closely connected to you, gives benefits to those who attain it, is it necessary to say that those who attain you would get salvation?“. embAr (bhagavadh SrI rAmAnujar’s successor in the line of AchAryas in our sampradhAyam) would always meditate on this pAsuram since this pAsuram says that thirumalai serves as a means for attaining emperumAn. viN kodukkum – will it not grant paramapadham (SrIvaikuNtam)! vazhi ninRu ninnaith thozuvAr – those who worship you in the way it is mentioned in vEdhas, dharma SAsthras (texts based on righteousness), ithihAsas (epics such as SrI rAmAyaNa and mahAbhAratha), purANas (ancient texts written by sages) etc. bruhadhAraNyaka upanishath 6-5-6 says “AthmA vA arE dhrashtavya: SrOthravya: manthavyO nidhidhyAsithavya:” (the AthmA which is appropriate to be heard and thought of, is apt to be meditated upon and seen). bruhadhAraNyaka upanishath 6-4-2 says “thamEva dhIrO vigyAya pragyAm kurvItha brAhmaNai:” (let that brAhmaNa, who is the best among the gyAnis (those with knowledge) know about paramAthmA and meditate on him). “upAsanam dhruvAsmruthi: dharSanasamAnAkarathA prathyAkshapaththi”(upAsanam, steady mode of thinking, having the ability to look at all with equanimity and conspicuousness – all these terms have the same meaning). SrI bhagavath gIthA 18-55 says “thathO mAm thathvathO gyAthvA viSathE thadhanantharam” (he knows about me as I am and then attains me). Thus as mentioned in all the sacred texts, being in the path of upAsanam (devotion) up to the stage of dharSan (audience)of emperumAn. vazhuvA mozhi ninRa mUrththiyarE Avar – those who are having their nature as mentioned by vEdhas which are without any falsehood and have full integrity. chAndhOgya upanishath 8-12-2 says “Esha samprasAdhOsmAchcharIrAth samuththAya param jyOthirupasampathya svEnarUpENa abhinishpadhyathE” (this jIvan (soul) exits from this (physical) body, attains supreme being nArAyaNa and realises his basic nature) – as mentioned in such sacred texts, they manifest their natural behaviour. pazhudhu onRum vArAdha vaNNamE viN kodummum – it will give paramapadham (SrIvaikuNtam) without any shortcoming either in the result that is obtained [by the AthmA] or in the path taken [to reach emperumAn]. Since the result includes being servitor to emperumAn’s followers also, there will be no shortcoming in the result. Since emperumAn is the means for attaining him, there will be no shortcoming in the means too. maN aLandha sIrAn thirvEngadam – the thiruvEngadam hill has this quality [of granting SrIvaikuNtam]. Actually it is calling out “maNNaLandha sIrAnE” (the 8th case, also called as vocative case or viLichchol) (this could be construed as telling emperumAn “those who worship you in the ordained way would realise their basic nature; your thirumalai hill itself will grant SrivaikuNtam ”). Alternative explanation: the thirumalai hill owned by emperumAn who measured the world, will grant mOksham or SrIvaikuNtam. Hasn’t nammAzhwAr in his thiruvAimozhi 3-3-7 said “samankoL vIdu tharum thadam kunRamE” (the thirumalai hill will grant SrIvaikuNtam)! People will grant only what they have! [what applies to people would apply to emperumAn’s possessions too]. We shall consider the 77th pAsuram next. This entry was posted in iyaRpA, mudhal thiruvandhAdhi on August 25, 2017 by T N Krishnan.